From the Department of Neurology (K.W., Y.H., M.J., W.G. ), China-Japan Friendship Hospital, Chaoyang, Beijing, China; and Department of Neurology and McKnight Brain Institute (K.N.M., J.L., D.Z., I.L., G.X., T.A.) and Department of Anthropology and Genetics Institute (C.J.M. ), University of Florida, Gainesville. Spinocerebellar ataxia type 10 (SCA10; OMIM #603516) is an autosomal dominant cerebellar ataxia with variably associated extracerebellar signs.1,2 SCA10 is caused by an expanded noncoding pentanucleotide repeat in ATXN10, which normally ranges from 9 to 32 repeats3,4; pathogenic alleles have as many as 4,500 repeats.4 To date, SCA10 has been found exclusively on American continents. In this report, we describe a Chinese Han family with autosomal dominant cerebellar ataxia caused by an SCA10 expansion. The family in this case report lives in a northeastern province of China. The pedigree is noted in the figure, A. 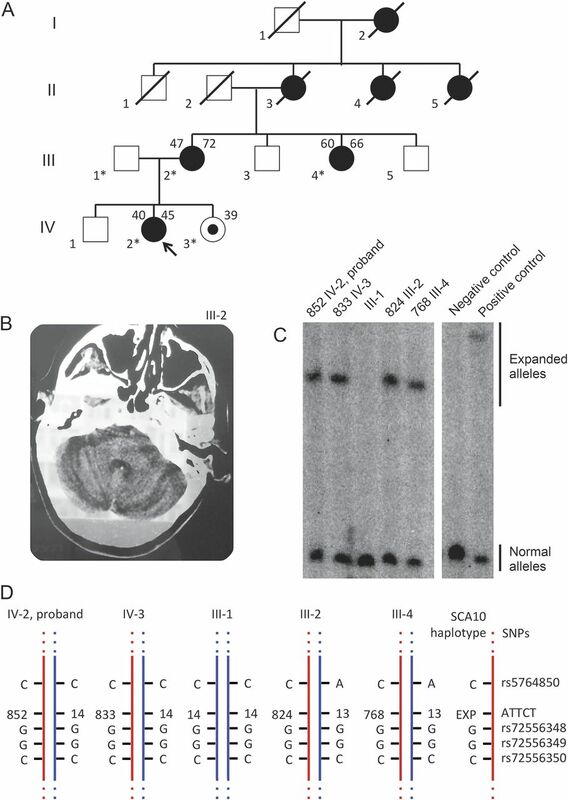 (A) Pedigree of the Chinese Han spinocerebellar ataxia type 10 (SCA10) family. As best as can be determined, marriages to individuals other than Chinese Han have been excluded. Squares, male; circles, female; black fill, affected; white fill, unaffected; black dot, asymptomatic. Upper left corner, reported age at onset; upper right corner, current age or age at death; lower right corner, pedigree numbering within the generation (asterisk indicates that a genomic DNA sample was obtained); arrow, proband. (B) CT scan of the cerebellum of the mother of the proband (III-2) is indicative of cerebellar atrophy. (C) Southern blot for SCA10 expansion was performed as previously described.4 Positive and negative controls are indicated and were run on nonadjacent lanes of the same blot. Calculated expansion sizes are indicated along with pedigree identifiers. (D) Haplotyping analysis of single nucleotide polymorphisms (rs5764850, rs72556348, rs72556349, and rs72556350) flanking the SCA10 expansion in intron 9 of ATXN10 in the Chinese SCA10 family was done as previously described2,5 and reveals a common haplotype. Red lines, SCA10 chromosome; blue lines, normal chromosome. This 45-year-old woman first noted gait imbalance at 40 years of age with accompanying dysgraphia, dysarthria, diplopia, short-term memory loss, anxiety, irritability, occasional bouts of insomnia, and recurrent headaches. She does not have a history suggestive of seizures. On examination, she had horizontal and vertical nystagmus, fragmented ocular pursuit, ocular dysmetria, scanning speech, mild limb and gait ataxia with a widened base, slow speed, and inability to perform tandem walking. She had no Romberg sign, sensory loss, or pyramidal or extrapyramidal signs. Mental and cognitive status were within normal limits (Mini-Mental State Examination [MMSE] score 30; Montreal Cognitive Assessment [MoCA] score 27) but with delayed word recall (2/5). Anxiety was rated as mild to moderate (Hamilton Anxiety Rating Scale score 20). Brain MRI and EEG results were normal. Mother of the proband (III-2). This 72-year-old female physician had progressively unsteady walking, dysarthria, and dysphagia since 47 years of age despite experimental therapies of cerebellar injection of embryonic stem cells (at age 49) and cerebellar vascular attachment surgery (at age 51). She later developed dizziness, insomnia, rapid memory loss, and frequent (up to once weekly) and often prolonged (up to 24 hours) apparent complex partial seizures consisting of altered mental status and automatism. Examination showed an uncooperative wheelchair-dependent woman who could not stand independently. Her cognition was severely affected (MMSE score 10/30, MoCA score 3/30). She had slowed saccades without nystagmus, scanning speech, and prominent limb ataxia without pyramidal or extrapyramidal signs. The family declined EEG and anticonvulsant medication. CT scan showed cerebellar atrophy, particularly in the vermis (figure, B). Maternal aunt of the proband (III-4). This 66-year-old woman began noticing unsteady gait and slurred speech at 60 years of age. She noted no dysphagia, seizures, or other neurologic deficits except mild memory loss. Her examination showed fragmented ocular pursuit, vertical nystagmus, scanning speech, limb and gait ataxia, and cognitive impairment (MMSE score 25/30, MoCA score 19/30) but no pyramidal, extrapyramidal, or sensory disturbances. Brain MRI scan was normal. EEG reportedly showed a single moderate-voltage 16- to 20-Hz spike-like wave, a few low-to-moderate voltage 4- to 7-Hz theta waves, and 2.5- to 3.5-Hz delta waves in bilateral anterior and middle temporal regions during wakeful state. Following informed consent and in accordance with institutional review panels at the China-Japan Friendship Hospital, genomic DNA was extracted from peripheral blood leukocytes and tested for the SCA10 expansion by repeat-primed PCR (RP-PCR)4 following negative results for SCA1, 2, 3, 6, 7, 8, 12, and 17 and dentatorubral-pallidoluysian atrophy. Further molecular analysis was performed on anonymized samples at the University of Florida after institutional review board approval. The proband (IV-2) tested positive for an SCA10 expansion by RP-PCR, as did her mother (III-2), maternal aunt (III-4), and asymptomatic sister (IV-3). The SCA10 expansion was sized by Southern blot and found to be in the pathogenic range (figure, C). Haplotype analysis showed the “C-expansion-G-G-C” haplotype shared by other SCA10-positive individuals2,5 (figure, D). We report SCA10 in a family outside the American continents. The clinical presentation of this family is complex and closely resembles “Mexican” SCA10 (with seizures).1 The later onset of disease in these individuals is likely a reflection of the short expansion length.4,6 Absence of cerebellar atrophy in 2 of the individuals is not entirely surprising given their late disease onset and comparatively short expansion allele. The presence of SCA10 in a Chinese Han family suggests that the original SCA10 mutation may have occurred before the divergence of Proto-Amerinds from ancestral Asians. However, as the shared SCA10 haplotype is relatively common, we cannot rule out alternative hypotheses, including (1) independent expansion events on a common haplotype but in separate geographic locations by chance, or (2) backflow of human migration from Beringia7 carrying SCA10 expansions into Asia. While SCA10 may be a rare cause of autosomal dominant cerebellar ataxia in China, the observation of SCA10 in this family suggests that SCA10 should be included in the differential diagnosis of ataxia in patients with Asian origins. Acknowledgment: The authors thank this family for their cooperation and participation in this study. Author contributions: Study concept and design: W.G., T.A. Acquisition of data: K.N.M., K.W., J.L., D.Z., I.L. Examination of study patients: K.W., Y.H., M.J., W.G. Analysis and interpretation: J.L., K.W., K.N.M., W.G., T.A. Critical revision of the manuscript for important intellectual content: T.A., K.N.M., G.X., W.G., K.W., C.J.M. Study supervision: T.A., W.G. Study funding: This work was supported by NIH R01 NS083564 to T.A. and by a grant from the Ministry of Health of China to W.G. The funders of this study had no role in study design or results interpretation. Disclosure: Dr. Ashizawa receives patent royalty from Baylor College of Medicine for the SCA10 diagnostic assay. Dr. Ashizawa also receives a book chapter honorarium from Elsevier. All remaining authors report no disclosures. Go to Neurology.org/ng for full disclosure forms. Accepted in final form September 1, 2015.
. Spinocerebellar ataxia type 10. Handb Clin Neurol 2012;103:507–519.
. Repeat interruptions in spinocerebellar ataxia type 10 expansions are strongly associated with epileptic seizures. Neurogenetics 2014;15:59–64.
. Polynucleotide repeat expansion of nine spinocerebellar ataxia subtypes and dentatorubral-pallidoluysian atrophy in healthy Chinese Han population [in Chinese]. Zhonghua Yi Xue Yi Chuan Xue Za Zhi 2010;27:501–505.
. Large expansion of the ATTCT pentanucleotide repeat in spinocerebellar ataxia type 10. Nat Genet 2000;26:191–194.
. Ancestral origin of the ATTCT repeat expansion in spinocerebellar ataxia type 10 (SCA10). PLoS One 2009;4:e4553.
. Paradoxical effects of repeat interruptions on spinocerebellar ataxia type 10 expansions and repeat instability. Eur J Hum Genet 2013;21:1272–1276.
. Updated three-stage model for the peopling of the Americas. PLoS One 2008;3:e3199.